It all started back in February of 2013. I had written the blog post “STAR Awards” and it featured this picture. 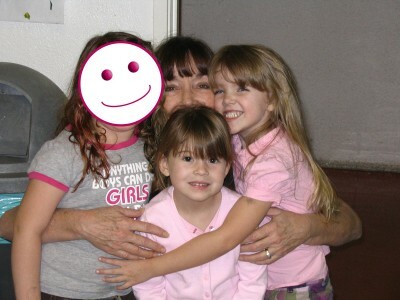 This is a picture of Amara and 2 of her best friends — best friends both then and now. They had all gotten STAR Awards. STAR is the “Standardized Testing and Reporting Program”. I had gotten permission from both of the girls moms to post the photo. It was at this same time that I had been nominated for Grandparenting Blog of the Year for 2013 and I needed votes! The Mom of one of the girls in the photo sent my blog post on to her Mom to read (and to solicit her vote) and I got the sweetest email from her that evening. I’d posted a picture of her granddaughter! That is her in the middle. We soon became Grandma Pen Pals! She lives in Michigan which is where I grew up. We had granddaughters who were best friends and daughters who were best friends. How could we not be friends, too? The fact that this Grandma lives in Michigan gave us another thing in common. In fact, it is because she lives in Michigan that her granddaughter and I had become special friends long before the STAR post. She and Amara went to preschool together and I got to be grandma for the day to her and another of Amara’s friends at the Grandparents Day Celebration. Long distance Grandmas can’t always be there so I had 3 granddaughters that day! You know how I love to take pictures. I had tons of pictures of this girl and her entire family that I could send her and I did. I know how lucky I am to get to see all the everyday stuff that she was missing out on. 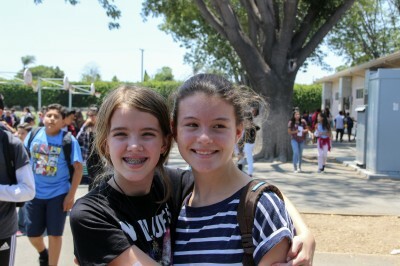 I was always at school with my camera and I just made it a point to try and remember to get pictures to email her. We have even gotten to meet a few times when she has visited California. So fellow bloggers — get involved at school and take some pictures. You never know what Grandma you could be helping out or what friend you might make! This memory was posted in Grandparents and tagged friends, pen pals, school on August 21, 2016 by Grandma Kc. I hope we get to meet someday too! I would love to go back to Canada to meet you but you would love coming to the beach, too! Who knows what the future holds. As for sending her photos I would want someone to do that for me! In fact this morning is Amara’s first day and Jenna just emailed me pictures – do I do know how it feels when you can’t be there! That is great. You are so, so lucky to be such an involved grandma. I love that you have the opportunity to share the wealth! Exactly! I was sharing the wealth! I am going to miss doing it. This is absolutely true! I know that grandmas who can’t be there on a daily basis just want to gobble up every scrap of information that involves their kids. You are so kind and generous to be that branch of loving attention between this pair! I know Amara’s first day at her new school is tomorrow. I am so looking forward to hearing about how well she does. Lots of adventures ahead for us to share because of your picture taking and story telling skills! I wish every Grandma could find a pen pal to take pictures for them — maybe some how you can find one in Texas to take pictures for you! Moms are so busy trying to deal with the everyday chaos they don’t always have time to take pictures of the everyday stuff. We Grandmas have time to do it! Awe that’s so sweet!! 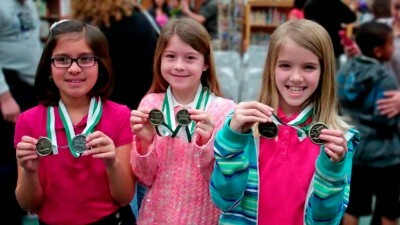 And I love the pic of Amara and her friends with their medals. Go girls! And I’m thinking you need to take a trip back to MI and visit your grandmas friends ???? I do need a trip to Michigan and this time I need to meet up with your Mom, too! Another Michigan Grandma friend the result of blogging! I need to time it so that you are there visiting when I do. Yes! You definitely need to come back to MI and visit!!! Your sister misses you terribly!!! How wonderful that you’re sharing your pictures with your grandma friend! I know she loves them as much as I do!! I would love to come home and visit my baby sister and everyone else! Love you! It tugs at my heart that I am not going to be there to take a picture of them tomorrow on the first day. You have 4 wonderful grandchildren. I’m just glad that our daughters will remain friends so even though I don’t see them at school I will still get to see them and I promise to take pictures when I do. I just need to start making some of these Grandma friends closer to home! I would LOVE to have coffee/beer with you but NH is a long drive! Just stopping by from the GRAND Social. What a great way to find other grandparents’ blogs. And I love the idea of Grandma Pen Pals. Glad you could stop by! Lisa’s GRAND Social is a fun way to find new blogs. I like your blog and I am going to take some time to read more of it. Us Grandmas have to stick together! I have both situations in my life; some of my grandchildren live close by and some live across the country. I feel that I have missed out on so much with the two that are far away It’s wonderful that you are reaching out to another grandma that has found herself in that situation. I am so glad we only live one mile from Amara and The Kids. I can’t even imagine what it would be like to have her across the country. At least in this wonderful time we live in you can stay in touch easier. It isn’t the same but it does help that we have Facetime and Google Hangouts. Thanks for stopping by! Love the name of your blog! What a great story! It is so you! It is so nice to make new friends. I am sure you will be very missed at Amara’s old school. Today was hard. Today the kids at Santiago all went back to school. And I wasn’t there to take pictures… So glad I have so many of those people on FB so I can see the kids but it makes me miss them. Great idea! I just made arrangements today to be in San Antonio for Ezra and June’s grandparents luncheon at their school in September. I’m excited that they are both at the same school this year so I can have lunch with both of them. I am so glad you get to go!!! I am going to miss orchestrating this for Santiago and I really hope they continue the tradition. I think Grandparents love it! Hope they have a great school year. Are you going to teach? Grandma pen pals–what a great idea! I’m sure she appreciates the photos and updates. I think I am going to miss taking them almost as much as she is going to miss receiving them. You always a camera in your hand so you know how much fun it is. Sounds like long-distance friends can be a long-distance grandma’s best friends! So wonderful you can fill in for those who can’t be there. Not only do you get extra grandkiddos now and then, those special kids get an extra (and super cool) grandma now and then, too. Love this, Kc! 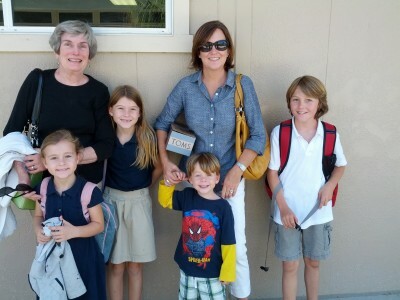 I have to say I love getting to be Honorary Grandma to so many kids! Grandmas always have extra room in their hearts for another child! So often, when asked, “What did you do today?” not much is forthcoming. How great for that grandma to have some photo evidence as a talking tool. Sweet. I think when you are busy being Mom to 4 kids you don’t think to take time to photograph the everyday moments. So glad I could do this for her.